Hygiene Matters. Keep Your Email Lists Clean. Blog Email Deliverability Deliverability Hygiene Matters. Keep Your Email Lists Clean. Take a leaf out of the book of healthy living and apply it to your email lists. Just like you need to detox your body every now and then, email lists need to have the dust shaken off them and audited for quality control. Thats right – quality. While quantity does matter, the quality of your email lists is more vital as it has a direct impact on your sender score and thus deliverability. This week’s digest highlights ways to keep those lists clean, and grow them too. How was your list acquired? How long ago did subscribers join your list? What did you promise them? Have you kept your list clean? Are you removing bad email addresses? Have you reengaged inactive subscribers? All the above factors play a part in determining the success of your campaign, so pay heed and keep your list healthy! Make it easy to opt in on your website. Don’t stop at just one. Collect email opt-in in your stores. For more details on ensuring the quality of your list as you grow it, hop on over to read the full article by Mike Hotz from Responsys. Here are three evergreen email marketing tips from the book, Email Marketing Rules: How to wear a white hat, shoot straight, and win hearts by Chad White from ExactTarget. Focus on maximizing the value of a subscriber, not on maximizing the results of a campaign. Don’t sacrifice the quality of your list for the sake of a one-off campaign by misleading subscribers. Don’t attach too much meaning to your open rates. The end goal of conversion is more important, hence gauge the success of your subject lines by that standard. Accept that ESPs have relatively little control over the deliverability of your emails. Sender reputation is the most important factor in deliverability and that’s related to the quality of your list. Email guru Loren McDonald recommends replacing three obsolete email practices. Annual reactivation campaigns – You can tell within a few months of a subscriber is unengaged so put them on a multi-step activation track. This helps ensure high quality lists too. Frequency testing – Use behavioral triggers instead. Single emails – Send a series of emails instead. 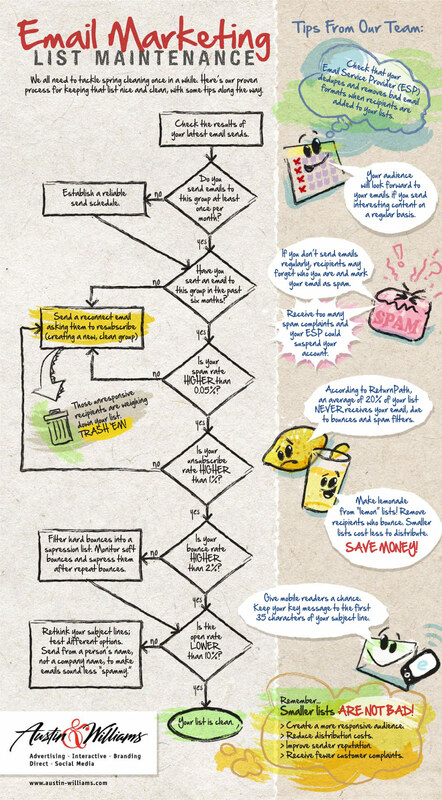 Here’s a really cool flowchart on maintaining your email list. Our SVP of Deliverability Strategy, Kate Nowrouzi, explains what you should do if you've been unfairly listed on Spamhaus. Gmail's Promotions Tab: Friend or Foe? Discover how Gmail's Promotions tab makes life easier for their users and can potentially help increase open rates on your marketing messages. Our new ebook, Email 101 for Financial Services, is designed to help financial services companies learn how to improve the ROI of their email operations. Try SparkPost and see how easy it is to deliver your app’s email on time and to the inbox.